Originally created by John Deer’s grandparents in the 1950s, John Deer’s Embroidery Legacy (then known as Dress Crest Embroidery) first began as a commercial Schiffli loom embroidery factory. In our humble beginnings, we began by creating lace for the bridal industry across North America. Over the span of 40 years we had grown from 1 small factory to 2 factories operating 6 Schiffli Looms, 136 multi-head embroidery machines and 54 employees. At this point we were creating all sorts of embroidered goods such as clothing, sports apparel and emblems. We were voted one of the top 100 volume embroidery manufacturers in North America (producing over 10,000,000 pieces of embroidered goods per year). In the mid-1990s the commercial embroidery production shifted overseas and away from North America. Out of necessity, John transformed the company into a commercial digitizing production house. Throughout the late 1990s & early 2000s, John Deer’s Embroidery Legacy (then known as Punch Perfect) digitized hundreds of thousands of embroidery designs per year for corporations across the world. This included work for Disney, Coco-Cola, GM, the NFL, & the NBA & John Deere (ironically enough) to list a few among thousands. During this period, John personally won 30 awards for his work. In the mid-2000s, the commercial digitizing market also began to shift overseas. John once again transformed his family’s embroidery company out of necessity. This time, John Deer’s Embroidery Legacy moved away from the commercial embroidery market and redirected its focus towards the home embroidery market with the name John Deer’s Adorable Ideas. For roughly a decade Adorable Ideas crafted a database of over 26,000 quality embroidery designs, numerous educational series and ran thousands of live embroidery events across the world. To date, Embroidery Legacy offers thousands of embroidery designs, Hatch embroidery software, tools, live events and more. In 2019, we’ve now become focused on drawing from our past and providing embroiderers with the best embroidery education available. We blend proven old-school embroidery techniques and wisdom with today’s modern technology. If you’d like access to our new free embroidery tips & tricks videos, be sure to click here to subscribe to our Youtube channel now. Our goal is to help further the beautiful art of machine embroidery by coaching embroiderers around the world. It’s no mystery… quality embroidery is our history. 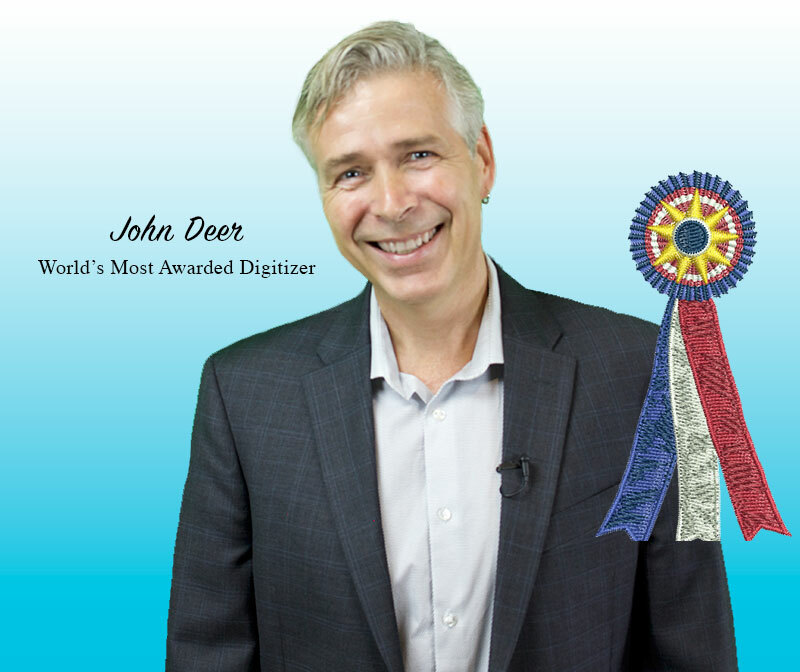 Winning 30 commercial digitizing awards, John Deer has been the most awarded embroidery digitizer in the world for over two decades now. As a 4th generation embroiderer, John has an extremely unique history in the embroidery digitizing industry as he is one of the last two remaining Schiffli Masters alive and teaching in North America. John learned and apprenticed under Swiss Schiffli Master Digitizers (then known as “punchers”) over 30 years ago in his grandparents’ factory, before computers even entered the digitizing world. John has ran 2 commercial embroidery factories, owned one of the world’s largest production digitizing houses, wrote the book “Digitizing Made Easy” (which has sold over 44,000 copies) and coached 100,000+ home and commercial embroiderers globally.